Listen to a webinar recorded on Mar 05, 2015. The discussion focussed on the latest developments in solid dosage form sample preparation, ahead of analysis. The webinar covered new hardware and software for the sample preparation of tablets, capsules, powders, gels, and liquids, based on the CambTEK Rapid Extraction System, as well as how your laboratory productivity can be improved by implementing the latest sample preparation solutions. 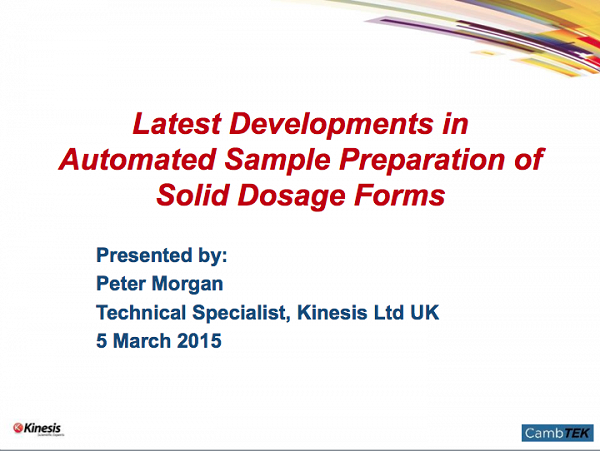 Peter Morgan of Kinesis (a multi-territory CambTEK distributor) presented the webinar and answered questions.